Grabbed the camera bag, whacked the horn. Cripes. Loud up here. Jumped out of the car and into thigh high snow. Checked watch, 5 minutes to go. Checked sky, darkening quickly. I plouged on. Soon I came to the cleaning in the forest. Good. Checked rails, faint dusting of snow. Excellent. I hadn't missed it. Checked signals, illuminated. It'd be here any minute now. The sun dipped under the edge of the storm clouds and a gentle warm light bathed the scene. I grabbed the camera, fired off a test shot. Good. Then without any warning it was speeding through the scene! I stared in wonder as its sleek form cut through the crisp air, and the sun glinted off its side. Perfect. Except I'd forgotten to take any photos! I fired off the first shot I could, hoping that it would be a keeper. As quickly as it'd arrived, it was gone again. I trudged back to the car and prised open the door, then carefully reversed down the access road. Seems a lot longer when you're reversing. As I got to the highway the sun disappeared and within minutes the snow was falling. Looks like I'd caught it just in time. Lights on, heater on, and I began the long drive back to civilisation. If the road got too bad I could always stay the night at the Snow-Ship-Inn and just hope their internet worked; last time I was there the satellite dish collected too much snow and started beaming signals to Mars. Sigh. Luckily I got home in one piece and was very happy with my single photo. Today marks the first day of Shinkansen services in Utrainia. It also heralds in a new era of Japanese technology rolling on Utrainia rails. Back in 2011 I took an E3 Shinkansen from Ueno to Akita and was very impressed by the train, and the ride. The "E3" is a special type of Shinkansen, designed for formerly-narrow-gauge track, and so is smaller than other Shinkansen; indeed it is a "Mini-Shankansen". However I think it is one of the prettiest shinks, lacking the low-drag "noses" of other shinks and having a very simple, clean appearance. Unfortunately they are now being retired after just 16 years service; that's the relentless pace of Japanese Shinkansen technology for you. Utrainia Rail was able to pick up one of these retired sets for a song on the used market, and today it arrived after just 7 days in transit. Utrainia lacks the highspeed corridors of Japan, and so Mr E3 will be able live out his days in relative peace without being subjected to the rigours of 275km/h operation. The Minister of Utrainian Railway Corporations, Mr Mikhail Douglaski, would like to thank the Tomix Corporation of Japan for their excellent engineering and fine workmanship. 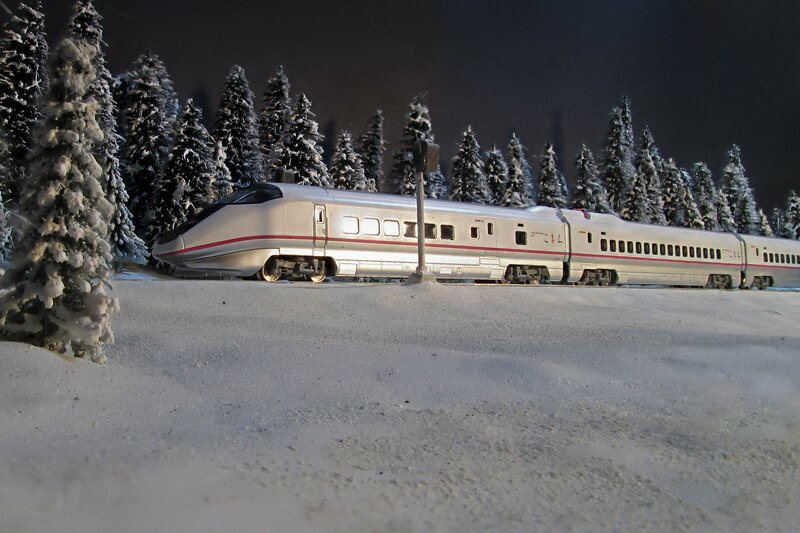 Utrainia looks forward to a new era of high speed travel! Love it! Michael you should write a novel! Your introduction was gripping!